The big news earlier this week, of course, was AT&T's announced plans to purchase Time Warner. As we, and plenty of others, were careful to point out, Time Warner is a different and totally separate company from Time Warner Cable (which Comcast famously tried to takeover not that long ago). Yes, at one time they were the same company, but that was a long, long time ago. They've been separate since 2009. And yet, lots of people still get them confused. 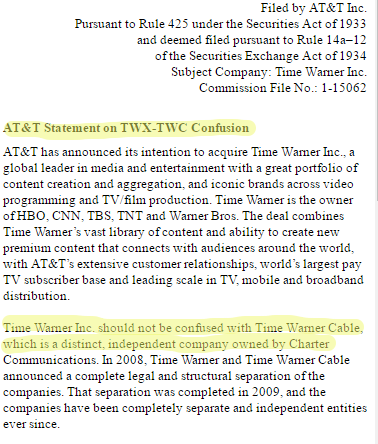 In fact, soon after the announcement of the deal, AT&T had to do a special filing with the SEC to clarify which Time Warner it was buying. Really. Apparently, the Senate didn't get the memo (literally). The Senate Judiciary Committee's top four members (from both parties) put out a press release from the antitrust subcomittee, saying that it was going to hold hearings on the merger, and that the CEOs of both companies would be testifying. But they named the CEO of Time Warner Cable, not Time Warner. Despite striking an $85.4 billion deal with AT&T Inc. over the weekend, [Time Warner CEO Jeff] Bewkes was unceremoniously left out of a release from the Senate Judiciary Antitrust Subcommittee, which said the CEOs of both companies would testify at a hearing on the proposed deal. The reason? The four top Republicans and Democrats leading the Senate Judiciary Committee and its antitrust subcommittee accidentally invited Time Warner Cable’s former CEO Rob Marcus instead. “Both Randall Stephenson, the CEO of AT&T, and Robert Marcus, the CEO of Time Warner, will testify,” the release said. The hearing announcement was sent by Sen. Chuck Grassley, Sen. Patrick Leahy, Sen. Mike Lee and Sen. Amy Klobuchar. You'd think someone would have checked that. Oh, and it's even worse than it seems, because Rob Marcus isn't CEO of either Time Warner or Time Warner Cable. He left Time Warner Cable after Charter Communications completed its deal. And this is why so few people trust Congress. Congress is quick to opine on stuff that it regulates without doing even having the most basic understanding of what's going on. Summoning the wrong CEO of the wrong company is a pretty impressive flub.